The Hamilton Beach “The Scoop” coffee maker (49981) is a well-thought-out home machine that gets good reviews for quickly brewing a good-tasting cup of drip coffee. It’s quick, simple to use and most types of ground coffee can be used with it. Choose the brand, flavor and strength of coffee you prefer. Because it brews one cup at a time, you can vary the flavor of each cup. Choose 8 or 14 ounces of coffee per cup and the “regular” or “bold” setting to suit your tastes. The Scoop coffee maker was awarded the “2012 Good Housekeeping Very Innovative Products (VIP) Award” from the Good Housekeeping Research Institute. It was also given high rankings by the Industrial Designers Society of America (IDSA) for its ability to use ground coffee instead of coffee packs, and for giving users the freedom to choose the strength, flavor and cup size of their coffee. Wondering whether to try The Scoop? Skip to our conclusions. The Hamilton Beach “The Scoop” single serve coffee maker (49981) is a popular machine that brews a regular cup of coffee in 90 seconds. A travel mug of coffee may take two and a half minutes. Bold coffee will take longer. This is essentially a single cup drip coffee maker for personal use that allows you to brew coffee of any flavor or brand that is of standard drip coffee maker grind. You can adjust the strength of your coffee by using more or less water, or a coarser or finer grind, although fine grinds may cause the machine to overflow. For mess-free brewing, the manufacturer recommends a coarser, looser grind. Coffee can be scooped directly into the scoop filter, which is placed in the filter holder (a secondary fine-mesh filter), making it easy to set up the machine for brewing (no paper filter required). An LED light announces when the coffee is brewing and goes off when it’s done. The machine also shuts itself off when done. There are three parts that should be rinsed after brewing to keep the machine working optimally. There’s a knob on the side for hanging the scoop filter to dry after cleaning. The cup rest can be flipped over to accommodate a travel mug (not included). During the course of preparing this review we learned that earlier versions of this machine had 5 holes in the showerhead that distributed hot water evenly over the grounds. The 5-hole design allowed some of the water to bypass the coffee and flow directly into the cup, weakening its flavor and leaving those who prefer bold coffee dissatisfied. The showerhead has been redesigned and now has 4 holes. Water comes into greater contact with the grounds and complaints about weak coffee have diminished. The water reservoir accommodates one cup of coffee (8 ounces, or 14 ounces for travel mugs), so water needs to be added for each cup made. The brewer does not need to cool between cups. Some water is retained in the pipes inside the single cup coffee brewer to prime it for subsequent cups of coffee (about half of an 8 oz. cup), so the first cup may be short. Any short cups after that are most likely due to mineral buildup on the internal parts. Prevent this by following the manufacturer’s instructions and clean the machine with vinegar as recommended – weekly if you have hard water. The Scoop by Hamilton Beach is stainless steel with black trim. It produces little or no steam and is quiet. The only sound is gurgling as coffee is released into the cup. Run one or two “water-only” brewing cycles to clean The Scoop before brewing your first cup of coffee. Follow the instructions for brewing a cup of coffee but don’t add coffee grounds. Dispose of the resulting cup of hot water. To brew a cup of coffee, fill either an 8-ounce cup or 14-ounce travel mug with water, then lift the lid to the water reservoir and pour the water in. The water reservoir has two water level markings (8 oz. and 14 oz.). Be sure to not use more than 14 ounces of water. Close the lid. Before brewing, adjust the L-shaped cup rest to make sure your cup is as close to the dispensing nozzle as possible. The cup rest is easy to remove. Turn it upside down and snap it into place to change the height. Adjust the multilevel cup rest to fit the cup or mug you’re using and put the cup in place. Scoop coffee grounds directly into the scoop filter. There’s a marking for 8 ounces of coffee and another for 14 ounces. Do not fill it past the MAX fill line. Or, use 2 Tablespoons of coffee for an 8 oz. cup and 3 Tablespoons for 14 ounces. Adjust the amount up or down to create your perfect cup of coffee. Place the scoop into the machine, close the lid and press the “Regular” or “Bold” button to begin the flow of coffee. 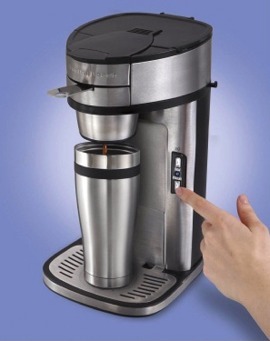 The “Regular” button will produce standard automatic drip coffee. Use the “Bold” button for flavored, decaf, finely ground and premium brand ground coffees such as Starbucks and Dunkin’ Donuts, as well as for stronger coffee. The “Bold” setting dispenses the water more slowly, allowing more contact time and flavor extraction. Keep in mind that the finer the grind, the longer it will take to brew. The Scoop coffee maker heats water to 175 – 185 degrees and will automatically shut off when brewing is complete. To stop it mid-brew, press either the “Regular” or “Bold” button and the unit will turn off. If there is no water in the reservoir, the unit will not brew. The LED light will blink for 5 seconds and then turn the coffee maker off. If grinding your own beans, use a standard automatic drip grind for best results. Very finely ground coffee delays brewing time and can cause the unit to overflow. If the machine does overflow, try switching to the “Bold” setting or use slightly less coffee and a coarser grind. Note: this coffee maker uses ground coffee only. Don’t try to use pre-packaged coffee packs. 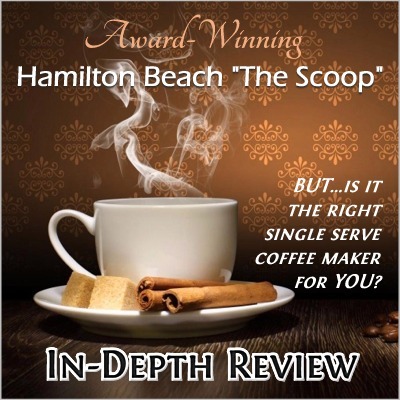 In the following video, skip ahead to 2:38 for a demo of The Scoop single serve coffee maker from Hamilton Beach. Ground coffee, preferably with a standard automatic drip grind. Regular or bold drip coffee of any flavor (caramel, hazelnut, vanilla, etc) and any brand (Starbucks, Dunkin Donuts, etc.). 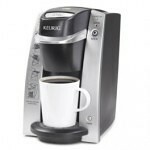 Run the brewer without coffee grounds to produce hot water for tea, hot chocolate, instant soups, oatmeal and such. A stainless steel filter scoop is included. No other coffee or water filters are required. Tap water is fine, although filtered or bottled water may produce better tasting coffee, especially if your water tastes of undesirable substances like chlorine or sulfur. Since no K-Cups, coffee pods or capsules are needed, your ongoing costs will be for less expensive ground coffee or for beans you grind yourself. Keep in mind that some users report needing to use more ground coffee with this machine to produce a cup of comparable taste to that from an automatic drip coffee maker. 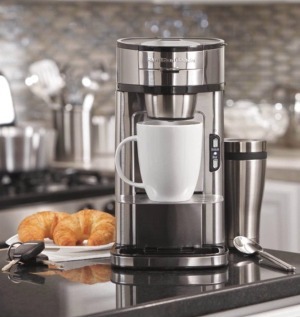 The Scoop by Hamilton Beach gives you the choice of brewing 8 ounces or 14 ounces of coffee per serving. The machine accommodates a mug that is 7” tall or less with the cup rest in the low position, and a cup of 4” or less in the high position. It takes less than 90 seconds to brew an 8 oz. cup. A 14 oz. travel mug brews in under two-and-a-half minutes. Coffee brewed on the “Bold” setting will take longer. Keep in mind that the finer the grind, the longer it takes to brew. “Regular” and “Bold” push buttons and LED “brewing” light. 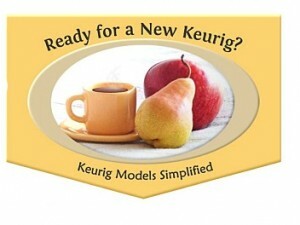 The coffeemaker will automatically shut off when brewing is complete. To stop it mid-brew, press either the “Regular” or “Bold” button and the unit will turn off. Unplug the machine after each use and allow it to cool before cleaning. After brewing, remove the scoop filter, dispose of the grounds and rinse it thoroughly or wash with soapy water. Towel dry the scoop, or hang it from the brew basket holder on the side of the machine to dry. Rinse or wash the secondary filter, too (filter holder), as some grounds may have collected there, and the filter basket if needed. Also wipe away any grounds that have adhered to the showerhead and gasket so water isn’t blocked during brewing. Wipe down the outside of the machine as needed with a soft damp non-abrasive cloth. Wash the filter basket and other removable parts with soapy water at least weekly. The scoop filter, filter holder (secondary filter), filter basket and multilevel cup rest are all dishwasher safe. Clean the machine internally once a month (weekly if you have hard water). Pour ½ Cup of plain white vinegar and ½ Cup of cold water into the water reservoir. Position the cup rack for a short mug and put the mug in place. Press the “Regular” or “Bold” button once. After thirty seconds press the “Regular” or “Bold” button again to stop the brew cycle. Wait 30 minutes, then restart the machine by pressing the “Regular” or “Bold” button. In cases of excessive mineral buildup, allow the machine to rest with the vinegar water solution in the tubes for several hours or even overnight before proceeding. When the cycle is finished, allow the machine to cool and discard the contents of the mug. Replace the empty scoop filter and run two or three more cycles with cold tap water to remove all traces of vinegar. If going on vacation, turn the cool machine upside down over the sink and allow all water to drain out so it’s not sitting stagnant in the tubes for an extended time. Also drain the machine before moving it to another location. Allow the machine to dry thoroughly before storing in a place where it might freeze. After draining, do a couple of brews with just water so the tubes are primed for brewing. The Scoop is warranted to be free from defects in material and workmanship for a period of one (1) year from the date of original purchase when used in home settings. The warranty is void if the machine is used in commercial settings or with a voltage other than that specified. The manufacturer can be reached by phone weekdays during business hours and any time by email. Contact the seller to handle refunds and replacements. Replacement scoop filters, filter baskets, filter holders and multilevel cup rests are available. The warranty will be voided if you open up the machine to try to diagnose a problem or fix it yourself. Uses ground coffee, not single-serve packs or pods. Proportions coffee exactly with markings on the single-serve scoop filter. Brews an 8 oz. cup of coffee in less than 90 seconds, 14 ounces in 2.5 minutes. Built-in adjustable cup rest holds standard-sized cups and taller travel mugs. One steel mesh scoop filter included; no need for paper filters. Wide drip tray acts as a spill-resistant drain for excess coffee. Settings for Regular (automatic drip) and Bold coffee. 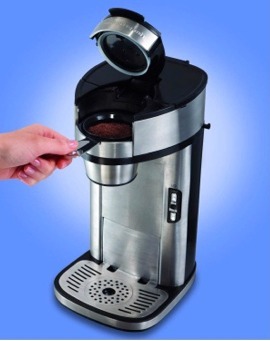 Durable, stainless steel features ensure coffeemaker’s longevity. Automatically shuts off after brewing. Plastic parts that come into contact with water and coffee are BPA free. Coffee maker, one scoop filter, multilevel cup rest, filter basket, and filter holder. Use and Care Guide, Quick Start Guide and Coffee Tips are also included. Travel mug not included. Unit size: 13.5″H x 9.8″D x 7.6″W. Overall height when the water tank lid is open is just under 17”. Cord: 24” long with a two-pronged plug. Accommodates a mug that is 7” tall with the cup rest in the low position and 4″ tall in the high position. Hamilton Beach’s The Scoop saves energy by automatically shutting off after brewing. The travel mug and replacement scoop filters, filter baskets, filter holders and multilevel cup rests are available from the manufacturer. A solid, basic single cup coffee maker that’s easy to operate. Its small size makes it great for small kitchens, dorm rooms, RVs, home offices, and for taking on the road. Uses ground coffee from any brand and of any flavor. Has Regular and Bold settings for varying coffee strengths. Produces hot water for tea, hot chocolate, instant oatmeal, etc. Choose between making 8 ounces and 14 ounces of coffee or tea. 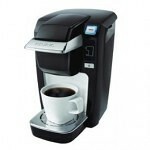 More economical to operate than machines that use K-Cups, pods or capsules. 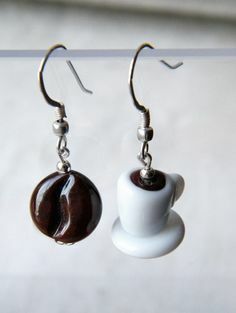 Accommodates a travel mug (not included). There’s no need to use special water, although filtered or bottled water is recommended for best taste. No paper coffee or water filters to deal with. The coffee has good flavor. Does not have a reservoir with hot water, therefore the brewer must heat and brew each cup of coffee separately. May take some experimenting to produce the desired taste and strength of coffee. Some splattering may occur, if there’s too much space between the mug and dispenser spout. Finely ground coffee, too much coffee and too much water may cause the machine to overflow. Like any drip coffee maker, coffee may drip for several minutes after brewing is complete. Messier than machines that use pre-packaged coffee in cups, pods or capsules. No auto-start feature so you can’t schedule it to begin brewing at a certain time, like first thing in the morning. Run a cup of half white vinegar and half water through the machine (without coffee), and follow with 2 or 3 brews of just water to remove any lingering plastic taste and smell. To change the cup rest from the low to high position, remove it, turn it upside down, then insert the two tabs on the shelf into the corresponding slots in the machine. Coffee that’s dispensing can splash if the cup is too far away from the dispenser spout. Put the cup holder tray in the high position, put something on the cup holder tray to lift the cup up, or choose a taller cup. More splattering can occur with the “Bold” brew setting because of how the coffee dispenses so cup height is extra important. Reviews suggest you may need to experiment to achieve the flavor you want. For a bolder brew experiment with the following: use less water (try 6 ounces), a little more coffee, a little finer grind, a dark roast, sprinkle water over the grounds to wet them before placing the scoop into the machine, and use the “Bold” setting so the coffee is in contact with water longer. A paper filter can be placed in the scoop filter before adding coffee to prevent sludge in the bottom of the cup from fine grounds. It’s also reported that a paper filter slows down the water flow so the coffee brews a little longer, producing stronger coffee. Using too much coffee, coffee too finely ground or packing the coffee down can cause the machine to overflow. Carefully rinse all grounds from the scoop filter and the secondary filter (filter holder) to prevent overflows and late dripping. Mineral buildup from hard water can cause partial cups. Follow the cleaning instructions and let internal parts soak in the vinegar and water solution for 30 minutes or more. You can leave it for several hours or overnight. You may need to repeat this process for extreme buildups. Then, use bottled water when brewing to minimize future buildups. Partial cups can also be caused by water not flowing well through the secondary filter (filter holder). Wash the scoop filter and filter holder with soap and water after every use to remove all residue so water flows smoothly. If you check the scoop filter and there is brewed coffee that is being held up via water tension, remove the filter (by the handle) and place in over your cup and tap it a few times. To ensure that your coffee stays hot, warm your cup or travel mug before brewing. Fill the cup with hot water and let it stand for a few minutes. Pour out the water and it’s ready for coffee. 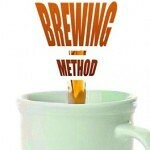 If coffee isn’t hot enough, use room temperature or warm water for brewing. An easy way to measure out the right amount of water is to fill the cup you’ll be brewing into and pour that into the reservoir. To avoid spilling water, some users recommend filling a measuring cup with a pour-lip with the correct amount of water and pouring that into the machine. Also avoid using more than the recommended amount of water. When removing your cup of freshly brewed coffee, place an empty cup under the dispenser to catch late drips. Some users report good results with putting loose tea in the scoop filter and brewing on the Bold setting (you may need more tea than usual for a strong enough brew). Putting a tea bag in the scoop filter also works for some. Others say to generate hot water and make your tea from that. Hot cocoa mix should go in the cup, not in the scoop filter. 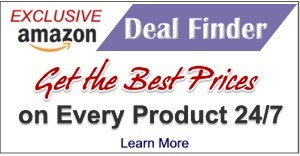 The Scoop single cup coffee maker is a bestseller on Amazon.com. At the time this is written it is highly rated with 2,171 reviews. A lot of people love their Scoop coffee maker from Hamilton Beach and feel it makes excellent coffee. While it’s messier than machines that use single serve coffee packs, most people used to making drip coffee don’t seem to be bothered by it. Some do feel it’s too much hassle to have to clean the scoop, filter holder and filter basket after every brewing, as well as regularly clean grounds off the showerhead and gasket, wipe up spatters and drips, and descale with a vinegar and water brew on a regular basis to keep the machine performing well. If you’re one of them, a K-Cup brewer may be a better choice for you. Most users don’t seem to mind that it takes a little longer to brew, especially on the “Bold” setting. The lower cost of ground coffee is a plus, as is the ease of setup, small size and quiet steam-free performance. The happiest users seem to be those who prefer standard, medium strength coffee. Those who prefer bold coffee may not be quite as satisfied, although performance has improved since the manufacturer reduced the holes in the showerhead from 5 holes to 4. Some find it too complicated to consistently produce a bold cup of the same quality time after time. Some users report that the coffee this machine produces is not very hot (drinkable without having to wait for it to cool), while most say the coffee is too hot to drink right away. Some recommend putting the cup of coffee in the microwave for a few seconds so it’s hot enough. The manufacturer says that the coffee is brewed at 175-185 degrees, so it comes out of the machine quite hot. However, the temperature of the cup, as well as cold creamer can lower the coffee temperature. They recommend pre-warming the cup by filling it with hot water and letting it sit for a minute before emptying it and placing it on the drip tray for brewing (or rinse it under hot water for a minute or two). They also recommend placing the cream in the bottom of the cup before brewing, rather than pouring it into the hot coffee. Using warm temperature water (never refrigerated) also helps. 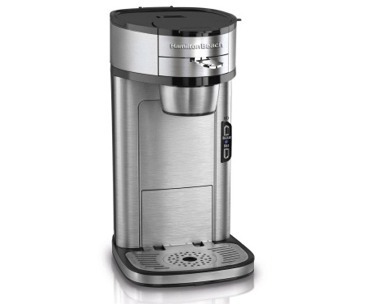 The Hamilton Beach “The Scoop” single serve coffee maker is reasonably priced and offers good value for a personal drip brewer. 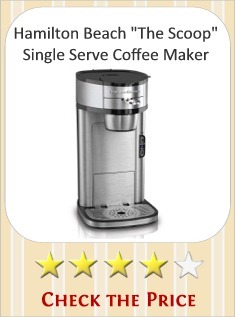 We agree with the many users who love the award-winning Hamilton Beach single serve The Scoop coffee machine (49981) for home use. 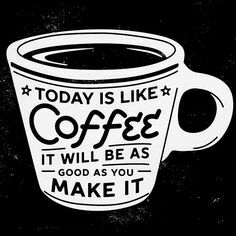 This is a good reliable choice, provided you like drip coffee, don’t mind a little mess and your taste buds don’t demand extra bold coffee. We appreciate its small size, ease of setup and quiet performance, as well as the fact that you can use flavored ground coffee from many brands. Just be sure to clean it regularly to ensure that it continues to perform well. If your tastes run to strong, bold coffee, you may need to do some experimenting with coffee types, grinds and amounts to produce a satisfying cup. Remember, bold coffee takes longer to brew in the The Scoop, so factor that in when choosing your single cup coffee maker.